Jos Poortvliet wrote shortly before the conference about merchandising. Today, he updates us on the status. As a quick recap from the earlier blog, note that the goal of the merchandising program is to support openSUSE ambassadors in visiting events and representing openSUSE there. The old program suffered from some issues, including bad planning, bad materials and very expensive shipping. It was simply not very efficient and we didn’t know how much good it did (or not). What we want to do can be best summarized as emphasizing quality over quantity and having a proper process. That means making a decent plan for supplying important events with a big box of quality materials and making sure we get a good return on the efforts we put in. And, as started with the Travel Support Program, we’d like the community to be in charge of it all, not SUSE. The ambassador/local coordinator/TSP teams make an event plan every six months or every year, looking at what events are coming. They classify them, determining what level of support each gets and who is going. This is of course coordinated with the individual ambassadors. The team then asks the openSUSE Team at SUSE to send the materials to the ambassadors, who in turn go and visit the event. At the end of every month we can let the wider community know about the events we visited! Right now, we’ve assembled a list of events, based on ambassador feedback and earlier event plans. I’ve also figured out what shipping options we have and what they would cost and made a plan for the contents of the box. I’d like to start with two different boxes, a big and a small one, and I have selected about 20 events which would get a box. 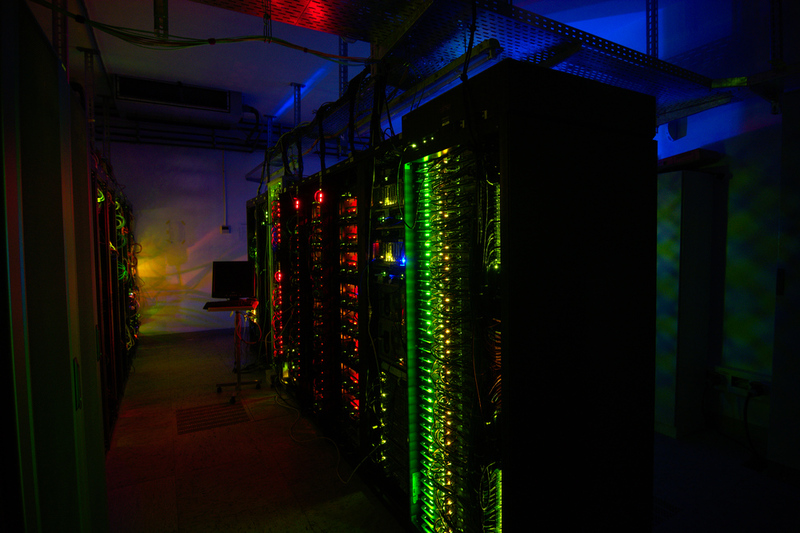 7 events will have visitors from the openSUSE team, so we’d be supporting 27 events with materials and people. Of course, the Travel Support Team can support other events – and we have the ability to locally produce materials as well. And after the first year, all this can be changed, with more and cheaper boxes (or fewer and bigger), different event selections and improved content. We’re aware that this plan is not perfect: quite a few people who received materials in the last years won’t with this plan. But that’s what happens when you decide to focus on a smaller number of events… And we have and can think about solutions for that; for example, create a 1-kg event box with very reasonable shipping costs. Second, planning is hard and harsh, and we want to be flexible in that regard, and open for feedback. So where are we now? Unfortunately, there has not been as much progress since the openSUSE conference as we hoped. A blocking issue is the availability of an artist handling the creation of materials we decided on. This will have to be done at SUSE with only a limiting role (for now) by the community artists. We are of course working on hiring somebody for this task but unfortunately one doesn’t just hire somebody. However, what we do have is a good idea of shipping, a decent event plan and we not only determined mostly what we’d like to ship in each box (and how heavy they will be) but also have already started talking to suppliers. So as soon as we can get the artwork situation resolved, we should be able to get up and running in relatively short order – hopefully before the end of this year. To give you a bit of an idea of what we have, see the image below. A big thanks for Anditosan for making the images that make the example booth picture here look good. He’s already gathering potential artwork for the booths and if you have any input – direct it to the openSUSE artwork mailing list. So, the plan now is that once we have a designer, we create and print the materials, assemble the boxes, make appointments with the ambassadors for the events we’ve planned and start shipping. This week, the openSUSE Team Blog is written by Agustin Benito who talks about how we’ve been documenting our work around openSUSE. 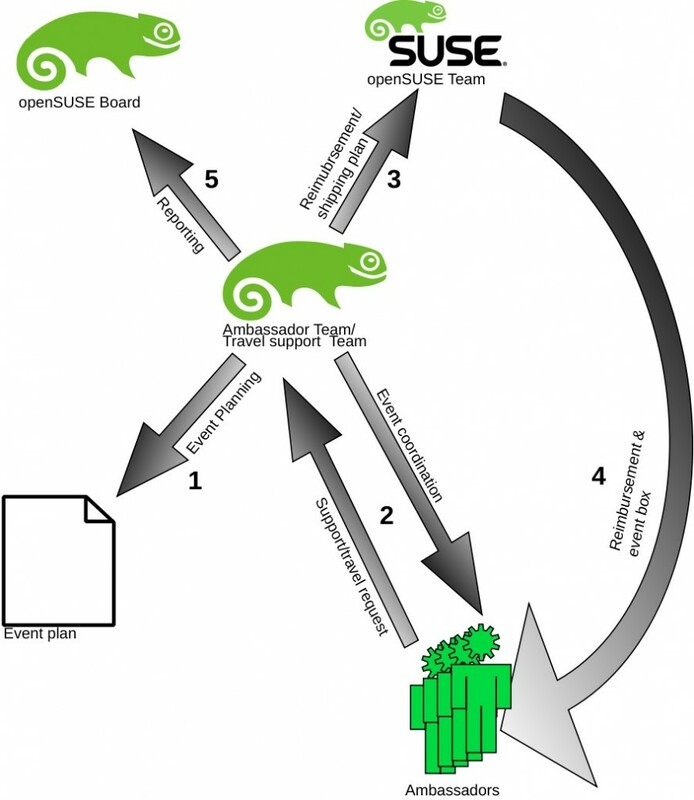 openSUSE Development process: creation and integration of the different packages. Milestones (alphas) and Beta. openSUSE Release process: stabilization, QA and task related with the availability of the different images. Update process. From Beta to the Release. Communication and marketing related tasks. The development of new features usually happens upstream or within SUSE (in collaboration with community members) before it is added to the distribution. This phase takes place before or in parallel with the Development process (of packages and integration). The decision taken by SUSE during 12.2 to concentrate the SUSE employees working on openSUSE in a single department by creating the openSUSE Team had as consequence that new people has joined us to work in openSUSE. One of the early decisions within the openSUSE Team at SUSE was to put more focus on the distribution. The Release Team was created as a subset of the openSUSE Team, formed by Coolo and Tomas (Ismail Dönmez and Michal Hrušecký were also part of it in the past) to take care of the Development process. It was also decided that the whole Team would have as major goal to drive the Release process. Starting in July 2012, the openSUSE Team at SUSE has put effort in documenting the Development + Release process. Throughout the years, the process has evolved and some of those changes were not documented or the documentation was not up to date. We have taken the opportunity to analyze the the Dev+Release process, so we could learn from it and being able to design and execute changes to improve it. As Team, we focused first on the Release process. We made an initial effort during the last few weeks of the 12.2 Release process, and we improved it during the first milestones of the 12.3 Release. For this 13.1 Release, only minor updates have been required. Increasing the efficiency of the management side of things and structuring our work as a formal project has been another aspect of this. We set up a management tool that now is used together with the openSUSE sysadmin team. Ludwig Nussel is the controller of our efforts as team in the Release, planned through progress.opensuse.org. The combination of this planning and the improved release documentation has helped us to increase our efficiency despite new people joining our team. During the past few weeks we have concentrated our efforts in analyzing and documenting the Development process. Our goal has been to analyze it, providing a high level view and just the minimum amount of details required to understand it by people with some knowledge of these kind of software integration processes. We have recently published a draft of the Development process on the openSUSE Factory mailing list and are open for feedback. How was this document done? 1.- The first action was to analyze existing documentation about the Development process. We took as sources several articles from openSUSE wiki and some previous analysis done by the former Boosters Team in this area. 2.- We organized two sessions in which different people described the different steps of the process. These sessions were taped. 3.- We transcribed the sessions and created a first document containing all the information about the process. 4.- We processed that “story” in order to get the high level view of the process. 5.- Using the ETVX methodology, we elaborated a first draft of the document. 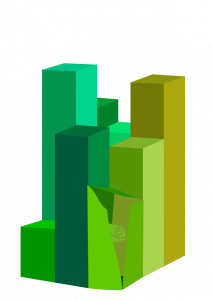 6.- We analyzed the result within the openSUSE Team and, after introducing some changes, we opened the discussion about it to other SUSE employees involved in the Development process. 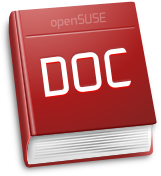 7.- Finally, in order to make the document easier to read (it is a complex process, so the documentation needs time to digest), we introduced improvements in the format and published in the openSUSE wiki, together with the .pdf version. This process has allowed us to analyze and discuss the process as a team, learning not just about the hows but the whys. It has also worked as a test for documenting future changes in how openSUSE is developed. We also hope that the effort can be worth it to contributors that want to get a high level view of how openSUSE works, since some of the tasks are done in house. This document has to be seen also as an exercise of transparency. At openSUSE Team, we are strong believers of the principle “no data -> no analysis -> no improvements“. We think we are better prepare now to propose to the community improvements in factory to make it more usable for a wider range of contributors. And like every week, we present you the top-ten of contributors to Factory! Our team blog this week is written by Stephan ‘coolo’ Kulow and he talks about work in the team done on the Open Build Service. For years one of the biggest complaint about the webUI was that it is impossible to find packages. The search ability has been part of the interface from the beginning, but with over 200.000 packages being build today it is crucial to get the right package. Especially for developers new to openSUSE and the build service it is common to have to search for the package to fix for a specific bug. So you find yourself looking for kernel in the webUI and you are prompted with tons of results that are displayed in a rather random order and the notion that your search resulted in more than 200 hits and is basically invalid. Huh? home:foobar:latest-experiments:kernel is surely not the openSUSE kernel to fix, but then what is? Now if you ask google about “kernel site:build.opensuse.org” you get closer to the problem at hand: “About 16,800 results” – that is a lot to pick the first 20 results to display from. The OBS webUI tried to find a good pick with an algorithm that might have been clever when build.opensuse.org had 100 projects. Today, it can only be called old and useless. So I tricked Ancor to look into the problem by claiming he would get all the praises in the OBS world for implementing a sane search. The problem is far from trivial, but there are good tools to get a better result than what we had now and Ancor has a lot of experience with these (and Rails in general). So it seemed like he could attain a great balance between effort and outcome. But as always the devil lay in the details, so this post is also about getting feedback about the actual result. Ancor integrated Thinking Sphinx into the OBS, so the name, title and description can be combined with other attributes into one big index that allows page ranking. We collected attributes which are most likely relevant for people searching for packages. For example, we gather the linkcount of a package into the database (so far only the backend knows what is a link and what is a plain package). The idea is to move links down in the source results. Coming back to the kernel example, the kernel-source package is the real package, while kernel-default, kernel-desktop, kernel-xen, …. exist too but are all links to kernel-source. So it is fair to present kernel-source first. Problem is: there are still 228 kernel-source packages in the build service (yes, people like branching the kernel – a lot), so the number of links pointing to the package is another attribute. Packages that other packages branch go up in the list while the resulting branches move down. What also plays a role in the calculation: is a package the devel package of another? (which is the final punch to have Kernel:HEAD/kernel-source as first result displayed, as opposed to the old searching algorithm displaying a discontinued “linux-kernel-nutshell” as shown in the screen shots). Of course nobody is perfect, and while the code of Ancor is close to, the weights given to the attributes were my choice, so all problems in the sorting you see are my fault. Please take some time and redo some searches you might have done in the past and report if the results are sane to your experienced eye. Within the HTML of the search results is a hidden span with the raw attributes used in the calculation, so if you find something strange, look for weight, linked_count, activity_index, is_devel and co. Possibly the package that looks bogus to you in the top results is just very active. Depending on the feedback we get, we might need to change the weights or add yet more attributes in the search and ranking. Do your own experiments on build.opensuse.org today! And as always, we finish with the top-ten contributors to openSUSE Factory of last week!